J. W. Trusler was Public School Inspector for Nipissing District No. 5 and was leader of the campaign that led to the establishment of Nipissing College. John Wallace "Jack" Trusler was born on December 20, 1898 in Camlachie in Lambton County, Ontario. He trained as a teacher at Stratford Normal School (1917) and later completed Bachelor of Arts (1937) and Master of Education (1955) degrees at the University of Toronto. During the First World War, he served with a fighter squadron in France after joining the Royal Flying Corps in June 1917. Following the war, he found employment at the Timken Detroit Axle Company in Detroit, Michigan (1918-1920) before returning to Ontario, where he worked as a public school teacher (1921-1929, 1932-1937) and as an RCAF flying instructor at Camp Borden (1929-1932). In September 1939 he was appointed Public School Inspector for Nipissing District No. 5 and relocated to North Bay. During his 25 years as Inspector, Trusler consolidated rural school boards in his District, co-authored a handwriting course that was widely used in Ontario elementary schools, and was involved in provincial curriculum committees. Following his retirement in 1964, Trusler served as Supervising Principal of the Widdifield Public School Board until December 1968 and was the Personnel Officer for the Nipissing Board of Education from 1969 to 1970. He was elected Alderman of the City of North Bay for 1970-1971. Trusler died in 1975. 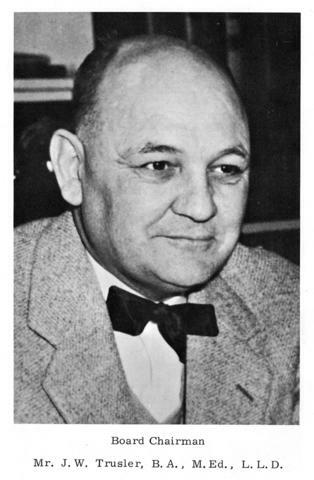 Trusler was instrumental in the successful campaign to establish a post-secondary institution in North Bay, in which he served as Chairman of the Northeastern University Committee (1959-1960), Chairman of the Executive Council of Northeastern University (1960-1967), and Chairman of the Board of Governors of Nipissing College (1967-1975). He was also a founding member of Northeastern University's Board of Directors and a member of the Campus Planning Committee that planned the College Education Centre, which opened in 1972 as the new home of Nipissing College and three other local colleges. Trusler's contributions to education were recognized in 1969 when Laurentian University awarded him an Honourary Degree of Doctor of Law; a public school in North Bay was also later named in his honour. Trusler's other volunteer activities included serving as Provincial Secretary of the Ontario Public School Men Teacher's Federation, as Field Secretary of the Ontario Educational Association, and as Chairman of the North Bay Library Board and the North Bay Tuberculosis Association. The custodial history of the fonds is unknown. Fonds reflects J.W. Trusler's work as Chairman of the Executive Council of the Northeastern University Committee (1959-1960) and as Chairman of the Executive Council of Northeastern University (1960-1967), specifically documenting his leadership in the campaign to establish a university in North Bay that eventually led to the founding of Nipissing College. To a lesser extent, the fonds also documents Trusler's work from 1967 to 1971 as Chairman of Nipissing College's Board of Governors. Fonds contains one series and consists mostly of correspondence, minutes, agendas, memoranda, reports, programs, media clippings, speeches, and presentations. The image linked to this description (j_w_trusler_1969.gif) is a portrait of J. W. Trusler from the 1969 Nipissing College yearbook, page 2.